Who are Devon and Halbe and why are they going to Europe?? On April 19, 2010, we, a newly married couple on the cusp of our 30’s, will begin a 5-month experiment, working and eating our way through Europe to learn about agriculture and sustainable living. On this blog we plan to track our observations, efforts and share what we learn. Five months, three meals a day: 450 meals. 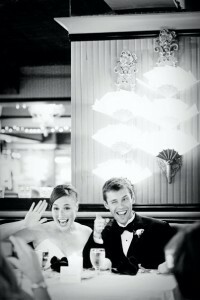 Devon and Halbe during their reception. Devon: A graphic designer by trade and a film producer by practice, Devon has worked in the entertainment industry for the last 5 years, most recently as a creative executive for Boz Productions. Devon has dreams of making a documentary about this trip to share his passion about the importance of eating healthy and fresh foods. Think of him as a Jamie Oliver in the making. Halbe: After studying international relations in college, Halbe decided that working to “make a difference” was her passion. Flash forward six years, she now has five years of fundraising experience for two national leadership development non-profits, most recently, the Posse Foundation, Inc. Aside from education, Halbe also has a passion for healthy eating and living. She sees no reason why the U.S. is not leading the world in healthy eating, something she believes is the answer to many, many of our country’s problems. The revolution has already started and she’d like to be at the forefront of this movement. She sees this trip as the impetus to fulfilling that desire. Halbe & Devon: After meeting in Seattle and dating for three months, it was clear that they had something unique and long-lasting. Almost six years later, they married in Seattle at a ceremony at the Lake Union Cafe on July 26, 2009. After going to Costa Rica for their honeymoon and returning to their lives in Los Angeles, their itch to travel the world wasn’t scratched. So, they decided to do more of it! But, instead of just traveling for the heck of it, they wanted to have a cultural, learning experience that meant “something.” Hence fulfilling dreams and learning about an issue that they are both passionate about – food. Now, Halbe the do-gooder, and Devon the film maker, are beginning a life-altering journey together that will stay with them throughout their lives.